Violent anti-Japan riots in China have led to several Japanese companies’s decision to shut down factories in China, at least temporarily. Canon’s factories in Zhongshan, Zhuhai and Suzhou cities will not operate on Sept. 17 and 18, according to Jiji Press. A decision is still pending on if normal operation will resume on Sept. 19, according to China Daily. Panasonic announced on Sept. 16 that its factory in Zhuhai city, Guangdong Province will stop normal operations until Sept 18, according to Kyodo News, a Japanese media. Mitsumi, the main manufacturer for Nintendo, announced its decision to temporarily suspend a factory in Qingdao, according to Kyodo News. LION Corporation, a company that makes household and personal care products, will call off production on Sept. 17 and 18 due to an anti-Japan parade scheduled to taken place nearby, said Nihon Keizai Shimbun, Japanese financial newspaper. “If the situation persists, Japanese companies will possibly have to leave China,” said a representative of Qingdao Japanese Association to Kyodo News. “I haven’t stepped outside for days. I’m full of fear. If our security is not taken care of here, I hope the companies or the Japanese government can help Japanese [living in China] to move back to Japan,” said a housewife who resides near the Japanese embassy in Beijing. The embassy has been the subject of protests and vandalism since last week. 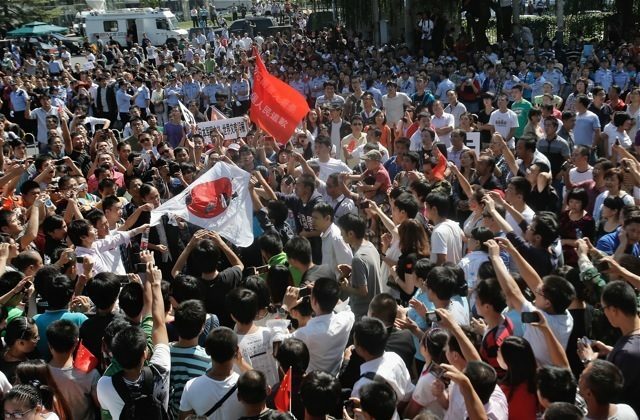 Anti-Japan protests, thought to be egged on or in some cases organized by the authorities, have spread through China recently. They reached their height last weekend, as the two countries continue to disagree about the Senkaku Islands, an uninhabited, rocky group of islands in the East China Sea. Violence against Japanese generally has also increased. A young Japanese volunteer that went to help earthquake victims in Guizhou Province was recently attacked, and the Japanese government last week told all Japanese in China to be aware of personal safety.